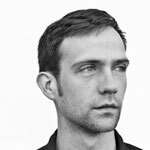 STUDIO Fellow James George is a Brooklyn-based media artist and programmer using code to create images and experiences in physical space. Lately he has been making permanent architectural installations, public projections, and mobile applications. George is an active participant in creative software communities and to contribute to open source initiatives. At the STUDIO George is collaborating with STUDIO fellow Jonathan Minard on their project, Point Cloud Portraits.